Santiago Lambre and Doloris. Photo Credit ©Sportfot. Mill Spring, NC – May 3, 2018 – The Tryon Spring I CSI 2* kicked off this week at Tryon International Equestrian Center (TIEC) with an FEI victory for Mexico’s Santiago Lambre and Doloris, continuing a competitive first week of international jumping at the venue. Lambre started the week with a blue ribbon in the FEI $6,000 Power & Speed 1.40m CSI 2* aboard D’Artagnan, and came out strong once again in the $35,000 1.45m Welcome Stake CSI 2* to secure top honors. Lambre and his Dutch Warmblood mare (Harley VDL x Colinda D) blasted through the Richard Jeffery (GBR) designed track with a quick round, stopping the clock in 38.11 seconds and besting the class of 64 original horse-and-rider combinations. Lambre has had the ride on the mare since she was a six-year-old and began competing her about a year and a half ago. With both consistent and impressive performances, the pair has continued their success this season, having notched five top five CSI finishes last fall at the venue, while tossing two champion placings into the mix as well. A total of 13 entries contested the jump-off, while Lambre rode three different horses in the class. At the conclusion, it was Doloris who ultimately returned to prove her place at the top of the class. The final ride of the day went to Carlos Ramirez (COL) aboard his own 2007 Belgian Warmblood stallion Happy Wandor Van’t Roosakker (Wandor van de Mispelaere x V Cento). The duo nearly took the lead, finishing just tenths of a second behind Lambre to receive second place honors with a jump-off time of 38.76 seconds. Third place was captured by Ireland’s Richie Maloney, who piloted Equinimity LLC’s Belgian Warmblood gelding Merqusio (Cicero Z x Flamenco de Semilly) to a jump-off time of 39.04 seconds. Mill Spring, NC – October 5, 2017 – From a field of 49 entries, Santiago Lambre (MEX) and his own Doloris, a 2008 Dutch Warmblood mare (Harley VDL x Colinda D), were the only pair to go double clear in the $35,000 Suncast® Commercial Welcome Stake CSI 2*, Thursday’s highlight class for the Tryon Fall III CSI 2* competition at Tryon International Equestrian Center (TIEC). Tryon Fall III welcomes back international FEI competition to the venue, beginning a four-week stretch of top show jumping competition, which will conclude on Sunday, October 29. Lambre and Doloris posted a blazing short course time of 37.60 seconds, while Tracy Fenney (USA) and MTM Farm’s MTM Reve Du Paradis, a 2005 Selle Francais gelding (Crown Z x Kaline De Semilly), stole second place with the fastest four-fault short course, stopping the timers in 38.07 seconds. Michael Morrissey (USA) took third aboard La Lopez 3, a 2008 Westphalian mare (Lenardo x Leandra) owned by QBS Equestrian LLC, with their time of 38.29 seconds. The class saw 49 trips on the course designed by Richard Jeffries (GBR), while only twelve returned for the jump-off round. The short course’s elements posed tough questions to the twelve combinations that contested it, explained Lambre. Samuel Parot (CHI) and Couscous Van Orti captured the win in the $6,000 Nutrena® 1.40m Power and Speed class to start FEI competition at TIEC. Parot and Couscous Van Orti stopped the timers in 25.78 seconds to take the victory ahead of Ibrahim Barazi (JOR) and Omnia Incipit, who earned second place on a time of 26.01 seconds. Parot also captured third place position aboard Dazzle White, completing the short course in 28.08 seconds. Parot has had the ride on the 2002 Belgian Warmblood gelding (Nabab De Reve x Vroni Van Orti), for several years, competing successfully around the world, as well as at the 2015 Pan American Games in Toronto. Santiago Lambre and Casino N. Photo Credit ©Sportfot. Mill Spring, NC – July 5, 2017 – Santiago Lambre (MEX) guided Casino N to a win in the $6,000 1.40m Nutrena® Power & Speed CSI 3* at Tryon International Equestrian Center (TIEC). Lambre and Casino N topped the class with a time of 30.805 seconds. Abigail McArdle (USA) also enjoyed another top three placing aboard Chuck Berry 8, after finishing with a time of 31.091 seconds. Erynn Ballard (CAN) and Thalys Z rounded out the top three after stopping the timers in 31.49 seconds. Lambre and Casino N, in their first outing in the past few weeks at TIEC, put forth a carefully executed power round before capitalizing on efficiency and skill in the speed phase of the course. Forty-four entries opened up the first day of international competition, while 31 pairs advanced to the speed portion of the class. Oscar Soberon (MEX) will handle course design for FEI classes in both the George H. Morris Arena, as well as on the Grass Complex. While Lambre now pilots the 2007 Swedish Warmblood gelding (Careful x Ahorn) owned by Stephex Stables, the horse was initially meant to be a ride for Lambre’s wife, before realizing that the horse’s scope and talent were quality at the FEI levels. Kristen Vanderveen and Bull Run’s Faustino De Tili. Photos ©Sportfot. Mill Spring, NC – July 2, 2017 – Kristen Vanderveen (USA) and Bull Run’s Faustino De Tili topped another grand prix at Tryon International Equestrian Center (TIEC), this time laying claim to the $86,000 Adequan® Grand Prix CSI 2*. Vanderveen and Bull Run’s Faustino De Tili stopped the jump-off timers in 38.341 seconds to take the win ahead of Darragh Kerins (IRL) and Silteplait De Circee, who earned second place with a time of 41.389 seconds. Todd Minikus (USA) and Incitatus collected third place, finishing just behind Kerins in 41.945 seconds. Vanderveen and Bull Run’s Faustino De Tili went towards the end of the class order, which saw 45 entries test the first track set by Ken Krome (USA). Ten combinations ultimately moved forward to the short track in which six pairs finished the morning with a double clear effort on the day. The pair’s partnership has reached new heights, as their consistency and tenacity together have outmatched other combinations at TIEC all season. After walking the course, Vanderveen thought that it was tricky enough to catch some riders off guard, which ended up being the case. With top performances coming in international competition at TIEC throughout the duration of their partnership, Vanderveen has sights set on expanding her growing business, as well as potentially representing the United States in FEI Nations’ Cup™ competition if the opportunity arises. Speaking to her growing confidence, Vanderveen explained that her success with Bull Run’s Faustino De Tili has in turn helped her riding on each of her other mounts, as she now feels consistently competitive on a major international stage. Abigail McArdle (USA) received the FEI Leading Lady Jumper Rider Award presented by Meg Atkinson of Town and Country Realtors, while Vanderveen’s groom, Luis Salvaras, was awarded with the Absorbine® FEI Groom’s Award, honoring his care and commitment to Bull Run’s Faustino De Tili. Emma Jolly of Keswick, VA and Mischief Managed, the winning combination of the $10,000 USHJA Pony Hunter Derby, were welcomed to the George H. Morris Arena for a special recognition ceremony before the highlight class of the week to honor their achievements during the first annual USHJA Foundation Pony Hunter Spectacular. Roger and Jennifer Smith of Tryon Equestrian Partners (TEP) also presented William Dobbs of the USHJA Foundation with a check of support from TEP for the organization and their mission. Santiago Lambre (MEX) and Ibabco, the winning duo of the past Thursday’s $35,000 1.45m Suncast® Commercial Welcome Stake CSI 2*, also earned top honors in the final FEI class of the week, racing to victory in the $35,000 Tryon 1.45m Challenge CSI 2*, which followed the conclusion of the $86,000 Adequan® Grand Prix CSI 2* in George H. Morris Arena. The duo completed the jump-off track in 38.442 seconds to secure the win ahead of Jonathan McCrea (USA) and Aristoteles V, who crossed through the timers in 39.813 seconds. Sharn Wordley (NZL) and Caiman Des Sequoias finished in third place with a jump-off time of 39.813 seconds. Forty entries tested the track, also set by the week’s FEI course designer Ken Krome (USA). Only four pairs advanced to the jump-off round, while the top three finishers completed the class with the only recorded double clear efforts. Ibabco, a 2008 Belgian Warmblood stallion (Nabab De Reve x Darco), flew through the jump-off track with Lambre piloting from the irons, earning their third FEI win at TIEC since the end of May. Kady Abrahamson of Loveland, OH and Charline 28, owned by Abrahamson Equestrian, finished atop the $20,000 Hollow Creek Farm Under 25 Jumper Classic after blazing through the jump-off track to best the competition by nearly three seconds. Abrahamson and Charline 28 finished the track in 35.487 seconds ahead of Abigail Evans of Spicewood, TX and her own Cyrus, who took second place with a time of 38.058 seconds. Simon Salame, who competes internationally for the country of Mexico, took third place aboard Elmo 19, owned by Christian Glaneman. The class saw sixteen entries, while only four combinations produced a clear round inside the time, moving them forward to the short course. Abrahamson and Evans were the only two riders to finish with a double clear effort in the jump-off. Isabella Durnell of Suwannee, GA and her own Carlton Diva were victorious in the $1,000 Pony Jumper Classic in the George H. Morris Arena after finishing with a jump-off time of 26.615 seconds. Ansgar Holtgers Jr. of Wellington, FL and Fort Lauderdale, owned by Daisy Talbert, captured second place with a jump-off time of 27.572 seconds. Isabella Cheers of Shallotte, NC and her own Park Avenue rounded out the top three with a jump-off time of 30.689 seconds, while adding four faults to their score. Hunt Tosh of Milton, GA and Uptown, owned by Douglas Wheeler, took first place in the $1,000 USHJA Green Hunter Incentive with a total score of 88. Daniel Geitner of Aiken, SC and Eleventh Hour, owned by Brenda Mackay, collected second place with a score of 87, ahead of Natalie Geller of Canton, GA and Homepage, owned by Fit to Print Farm, who finished in third place with a score of 86. The $1,000 Amateur-Owner Hunter Classic 3’3″ & 3’6″ saw Alexandra Desiderio of Chester, NJ and Joker De Fallogne, owned by Tranquility Farm, ride to a score of 163 for first place. Kimberley Quinn of Charlotte, NC and her own Sail On take second place with a 161, while Kaitlin Porath of Charlotte, NC and her own Breaux collected third place on a score of 158. Siena Vasan of Boca Raton, FL and Namesake, owned by Palm Ponies LLC, took top honors in the $1,000 Junior Hunter 3’6″ Classic with a score of 164. Vasan also secured second place aboard Skolar, owned by Carriage Hill Farm, after receiving a 163. Tanner Korotkin of Wellington, FL and Aribo, owned by Sandalwood Farms, rounded out the top three with a score of 156. Beverly Davis of Harrisburg, NC and her own Alchemist secured victory in the $1,000 Junior Hunter Classic 3’3″ with a total score of 150. Raegan Landrum of Winter Park, FL and her own Contano took second place with a score of 139. Emmanuelle Greenberg of Boca Raton, FL and Czech Mate, owned by Pumpkin’s Patch Farm, LLC, finished in third with a score of 138. Maddie Tosh of Milton, GA and Love Me Tender, owned by Dr. Betsee Parker, rode to victory in the $2,500 Pony Hunter Classic after receiving a final score of 167. Libbie Gordon of Statesville, NC and Childs Play Hot Topic, owned by Mia Abelo, finished in second on a score of 166.5, while Abigail Gordon of Statesville, NC and her own Farmore State of the Art, rounded out the top three with a score of 165.5. The $500 Green Pony Hunter Classic saw Emma Jolly of Keswick, VA and Sunset’s Sparkle, owned by Sunset Farm, finish with a final score of 151 to top the class. Marissa Santaniello of Waxhaw, NC and her own Bed Head Ned took second place with a score of 142, ahead of Libbie Gordon of Statesville, NC and All Yours, owned by Jessie Marie Spade, who placed third with a 139. Stephanie Zimmerman of Atlanta, GA and her own Crusader finished as divisional champions in the Marshall & Sterling Adult-Amateur Hunter Division, ahead of Ashley Waters Whitman of St. Augustine, FL and Heart Breaker, owned by Meredith King, who collected reserve champion. Jennifer Smith of Wellington, FL took both champion and reserve champion in the Marshall & Sterling Adult Amateur 50 & Over Division aboard her own Ocean Mist for champion and Olympic Fire, owned by Roger Smith, for reserve. The Amateur-Owner 3’3″ Combined Division saw Kaitlin Porath of Charlotte, NC and her own Breaux finish with champion honors. Emily Jones of Jacksonville, FL and her own Game Boy collected reserve champion accolades. Grayson Shelton of Charlotte, NC and Accomac, owned by Ashlen Rowe, captured top honors in the Children’s Hunter Horse 14 & Under Division. Sophia Mitchell of Wrightsville Beach, NC and her own Keepsake finished with reserve champion. The Green Hunter 3’3″ Division saw Todd Minikus of Loxahatchee, FL and Exceptional, owned by Todd Minikus, Ltd., ride to collect champion honors. Hunt Tosh of Milton, GA and Lights Out, owned by Ceil Wheeler, were presented with reserve champion. The Green Hunter 3’6″ Division saw Hunt Tosh guide Patriot, owned by The Wheeler Family, to solid performances throughout the week, ultimately placing them atop the division. Jodi Vazquez of Mettawa, IL and Hula Hoop, Elizabeth Corey, take reserve champion. The High Performance Hunter 4′ Division was championed by Hunt Tosh of Milton, GA and CasanoVA, owned by Dr. Betsee Parker, while Blythe Karolyi of Franklin, TN and Fondant, owned by Virginia Ingram, finished with reserve champion honors. Maddie Tosh of Miton, GA and her own Cozy Up, rode to the top of the Medium Pony Hunter Division, while Libbie Gordon of Statesville, NC and C.E. Remarkable, owned by Fielding Stichman, collected reserve champion. The Small Pony Hunter Division saw Abigail Gordon of Statesville, NC and her own Farmore State of the Art ride to collect champion honors. Jessie Marie Spade of Terrell, NC and her own With Applause were presented with reserve champion. Marissa Santaniello of Waxhaw, NC and her own Bed Head Ned rode to the top of the Small/Medium Green Pony Hunter Division. Libbie Gordon of Statesville, NC and All Yours, owned by Jessie Marie Spade, finish in reserve. Santiago Lambre and Ibabco. Photo Credit ©Sportfot. Mill Spring, NC – June 29, 2017 – Santiago Lambre (MEX) and Ibabco rose to the top of a massive class to take top honors in the $35,000 1.45m Suncast® Commercial Welcome Stake CSI 2* at Tryon International Equestrian Center (TIEC). The pair finished the jump-off track in 37.194 seconds ahead of Abigail McArdle (USA) and Chuck Berry 8, who finished just behind the winning duo with a time of 37.223 seconds. Andrew Ramsay (USA) and Cocq A Doodle rounded out the top three, stopping the timers in 37.753 seconds. The class saw 82 entries contest the first round track set by Ken Krome (USA), with 29 pairs advancing to the jump-off round. Only 12 combinations secured a double clear effort on the afternoon. Lambre and Ibabco went 22nd in the original order and held their lead through the remainder of the jump-off round. Ibabco, a 2008 Belgian Warmblood gelding (Nabab de Reve x Darco) owned by Lambre, has started to shine in international competition with Lambre over the past year. The duo connected last spring after Lambre purchased the gelding and the duo have finished with top placings since their partnership began. Speaking of the talents of Ibabco, Lambre touched on the athleticism and carefulness of the gelding, which are qualities he believes will make him a star in the coming months. Todd Minikus (USA) and Incitatus, a 2009 Oldenburg Springpferd gelding (Stakkatol x Con Air) owned by Alice Lawaetz, captured the win in the $6,000 1.40m Nutrena® Power & Speed Opener to kick off FEI competition at Tryon Summer V. The pair took the class with a jump-off time of 31.45 seconds, ahead of Abigail McArdle (USA) and Chuck Berry 8, who stopped the timers in 31.964 seconds. Andrew Ramsay (USA) and Cocq A Doodle collected third place with a jump-off time of 32.13 seconds. “It seemed like a nice opening class for the FEI horses. It left some room to make horses confident and get them going on the course. This is one horse I haven’t shown much before. He was the first horse in the class and did very nicely. Most of these horses are either young or inexperienced, so it was a good way to start the week for them,” commented Minikus. As for the pair’s goals, Minikus is planning on taking it slow through the summer months to help Incitatus find confidence in the larger FEI classes before a jump to some of the more competitive classes later on in the year and looking toward the beginning of 2018. “I think he’s going to have a big future. We’ll just see how much he can learn this summer and hopefully do the bigger classes this winter,” he concluded. Lexington, KY – May 21, 2017 – The Kentucky Spring Classic came to a close with a full day of Grand Prix show jumping action in the Rolex Stadium. The final day of competition held not only the $25,000 Under 25 Grand Prix, presented by Hollow Creek Farm, but also the $40,000 Bluegrass Grand Prix, presented by Audi of Lexington as well as the jump off round for the $130,000 Mary Rena Murphy CSI3* Grand Pix. Alex Granato was the quickest ride in the jump off class, earning him the win in the event that was originally scheduled to be held on Saturday evening after the Preakness Stakes. Eugenio Garza took home the blue ribbon in the Under 25 Grand Prix and Santiago Lambre stole the win in the Bluegrass Grand Prix to finish two weeks of top notch hunter and jumper competition. Lambre was also awarded the Kentucky Spring Classic Leading Rider Award, presented by Envisian Products, LLC. D’Artagnan, the 9-year-old KWPN gelding who helped Lambre fly to the win in the $40,000 1.45m Grand Prix with a time of 30.592, is part of a newer string of horses for the Brazilian athlete. The pair has previously won several 1.40m and 1.45m classes during the Winter Equestrian Festival as well as at the Tryon International Equestrian Center, before making their way to the Kentucky Horse Park. Lambre, who has spent a good portion of his career competing in Europe, recently transitioned to the United States full time to live in Wellington, Fla. The 2017 Kentucky Spring Series marked the first time Lambre had competed at the Kentucky Horse Park and after his numerous successful rounds of the past two weeks, the Brazilian athlete is looking forward to more trips to the area. With a full roster of thirty-nine horses, the $40,000 Bluegrass Grand Prix only saw eight clear rounds to return for the jump-off. Although French National Champion Eric Navet held the early lead on Basimodo with a clear time of 31.661, Luis Biraben and Colorado 210 eventually stole the second place honors by putting in a faultless effort and time of 31.557, sending Navet home to California with a third place ribbon. Earlier in the afternoon, Eugenio Garza piloted his own Barino to the top of the leader board in the $25,000 Under 25 Grand Prix, presented by Hollow Creek Farms, with a double clear ride and jump off time of 41.675. Garza, who won big on Friday night in the $35,000 Hagyard Lexington Classic Grand Prix on Armani SL Z, was the fastest of twenty-two starters in the class. Mavis Spencer and Chacco were second with a double clear effort and a jump off time of 41.834. The highlight event of the Kentucky Spring Classic, the $130,000 Mary Rena Murphy Grand Prix CSI3*, was won by American rider, Alex Granato and Carlchen W with faultless jump off round and a time of 41.73. Granato competed against forty-eight other riders during a class that was split between Saturday night and Sunday morning due to unexpected storms. Aaron Vale and Finou 4 finished just off the lead time in 42.36 and Michael Morrissey and Chance Ste. Hermelle rounded out the top three spots with a clear round and time of 43.45. The Kentucky Spring Horse Show Series saw awards go to athletes from all over the world who gathered in the Kentucky Horse Park for the annual event. Professionals and amateurs alike were able to compete in top level hunter and jumper classes, all while enjoying the world class facilities at the of the Kentucky Horse Park. Kentucky Horse Shows, LLC is looking forward to hosting their competitors again during their Summer Series that will take place from July 26, 2017 – August 6, 2017. 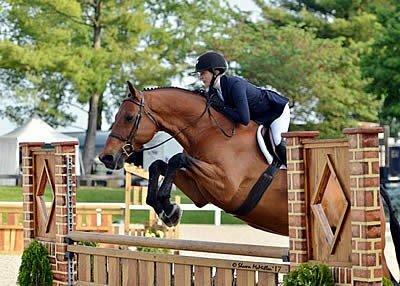 On the final day of the Kentucky Spring Classic, talented junior rider Emma Kurtz claimed the Large Junior Hunter division championship as well as the Grand Junior Hunter Champion title aboard Dr. Betsee Parker’s Dedication. Accumulating 46 points with the judges, Kurtz consistently placed at the top of the leaderboard on multiple mounts in the Stonelea ring and won the championship sponsored by Visse Wedell of Wedell Real Estate. On Saturday, Emma Kurtz of Hudson, Ohio executed two precise rounds in the Large Junior Hunter classes, landing Dedication, a bay Holsteiner, in second place after the first day of competition. Showcasing his reliability to perform well in the show ring, the 12-year-old gelding returned on Sunday and jumped his way to second place in the over fences classes, coming in third in the under saddle class. Although the pair had not shown together since the Winter Equestrian Festival where they regularly ribboned in the large junior hunter classes, the break between Florida and Kentucky did not prevent them from outshining the competition across the division. In addition to Kurtz, Dedication has also been shown by top hunter athletes Scott Stewart and Victoria Colvin in the professional and junior divisions. Competitive National and International hunter and jumper competition will resume at the Kentucky Horse Park in July with the Kentucky Summer Horse Show, presented by Kentucky Horse Shows, LLC.